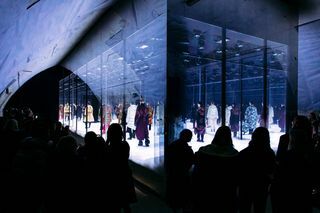 On February 20, Moncler hosted its third seasonal Genius project in Milan, Italy. 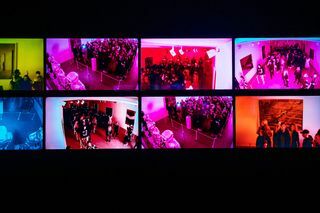 A sprawling crowd of thousands went in and out of former train depots beneath the city’s historic Centrale Station, each housing the latest collections from Pierpaolo Piccioli, 2 Moncler 1952, 3 Moncler Grenoble, Simone Rocha, Craig Green, Fragment Design’s Hiroshi Fujiwara, Palm Angels, and Poldo Dog Couture. 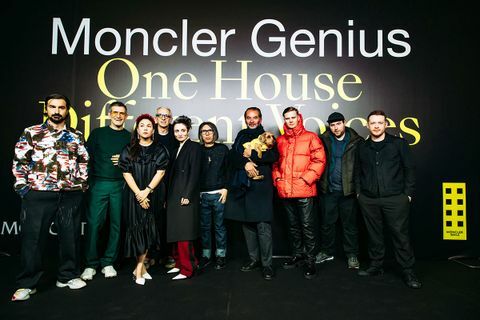 Staying true to its motto “One House, Different Voices,” this season sees the debut collaborative collections of 1017 ALYX 9SM’s Matthew Williams and Richard Quinn, as well as Veronica Leoni and Sergio Zambon now sharing design duties of 2 Moncler 1952. 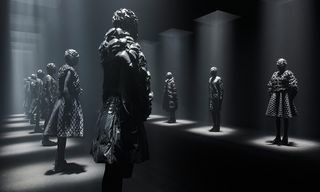 The project’s most ambitious undertaking to date, each collection was conceived as part of Genius’ effort to speak to the new luxury consumer by giving the diverse set of creatives the opportunity to reinterpret the Moncler identity. 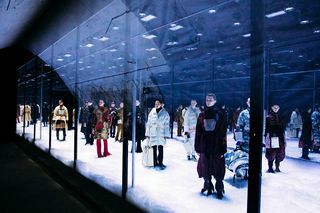 The result was by far Moncler’s biggest and best Genius collection to date. 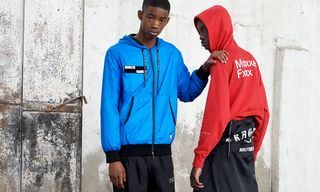 See a full breakdown of each collection below and look for Moncler Genius Fall/Winter 2019 to hit retailers and Moncler.com later this year. The Moncler Genius FW19 collection will be open to the public from February 24 at the below address. Registration and time preference is not necessary but strongly recommended and can be completed here. 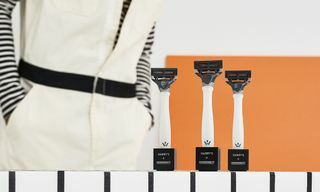 The standout collection of the evening, Matthew Williams’ first collaboration with Moncler Genius features his signature design elements, including the use of 1017 ALYX 9SM’s metal clasp, now done with Moncler branding. 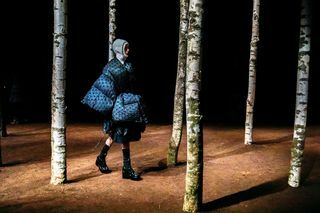 Elsewhere, the brand’s industrial sensibility and focus on functionality meet Moncler’s legendary outerwear across a range of beautiful garment-dyed jackets, down puffer coats and sleeping bags, all while managing to touch on Williams’ effort to always bring sustainable practices to his work. 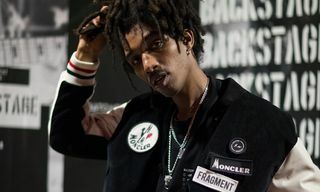 Hiroshi Fujiwara continues his collaboration with Moncler Genius, bringing Fragment Design’s aesthetics to a range of outerwear. 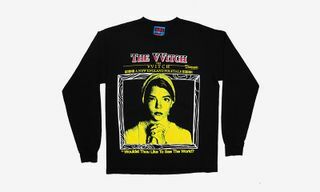 Difficult to see at first glance, the collection draws on aviator and Mod references mixed with bold lettering and cryptic expressions. Elsewhere you’ll see vintage, military, urban and tech references, all done so subtly you’ll swear you they weren’t there. A highlight of the collection is a blink-and-you’ll-miss-it Pokémon collaboration which features a Pikachu print on a down puffer coat, a nod to Fujiwara and Pokémon’s Japanese origins. 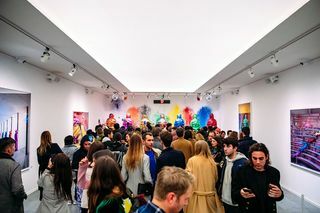 Palm Angels’ Francesco Ragazzi continues his provocateur streak, this time working with artist Willi Dorner to turn an otherwise typical gallery into a live vandalized piece of art. 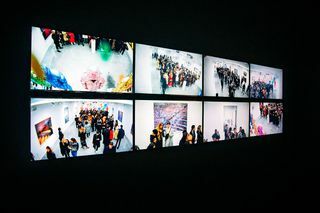 The lookbook presented in the space featured Dorner’s ongoing exploration of bodies in urban spaces, while the presentation featured a countdown that would shoot splatters of paint on the models once the timer struck zero and a visitor pushed a button as instructed. 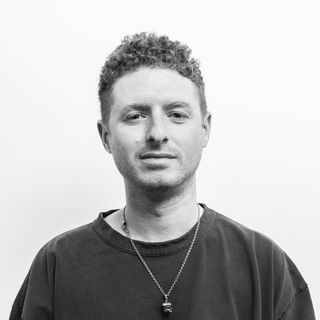 The collaboration revolves heavily around metallic, borderline foil finishes, resulting in a collection that perfectly blends Ragazzi’s multiple design philosophies, which he often straddles as artistic director of Moncler and founder of Palm Angels. 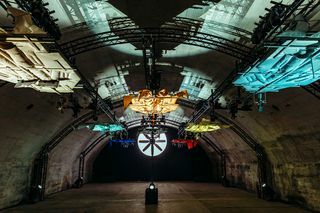 Celebrated British fashion designer Craig Green’s installation could be heard even over the dramatic music playing in the hall outside each depot. 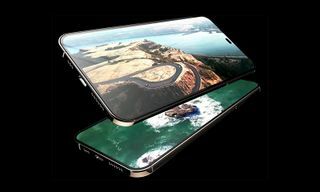 That’s because Green’s bold vision for his third Genius collection featured bold shapes suspended from beams that would rotate every few minutes representing the shift from day to night. 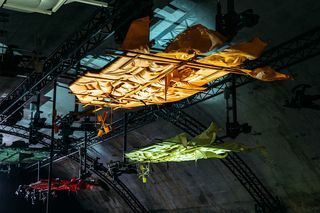 During the night phase, the shapes floated above visitors like boats on a sea, while during the day phase the clothing would blow beautifully through the use of industrial leaf blowers further powered by a fan typically seen in a giant wind tunnel. 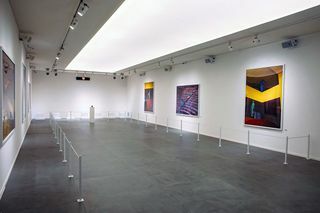 A striking contrast to the sheer volume of Craig Green’s installation, Richard Quinn’s room was silent and still, featuring a beautiful flower print on the walls and black flowers throughout. 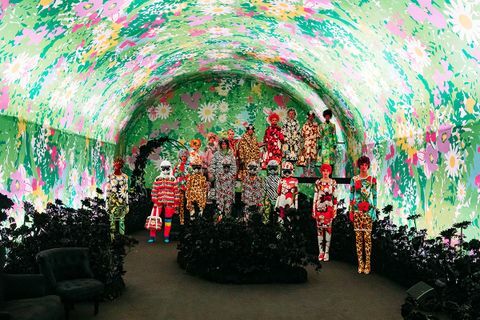 Toward the end of the depot, models stood side by side in bold prints as if posing for a portrait, creating the impression of a real-life three-dimensional painting. The combination of bold colors, opulence and couture shapes recalled glamorous celebutantes of the ’50s and ’60s. 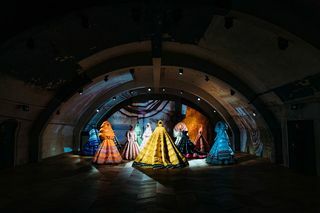 The first installation visitors were greeted with when they entered, Pierpaolo Piccioli took his signature voluminous shapes and crafted them out of Moncler’s most recognizable material, nylon laqué, creating a collection that perfectly fused the language of couture with patterns that recall African textiles. To achieve an authentic and original combination of this, Pierpaolo worked closely with Liya Kebede, who is an active supporter of African artisans through her label lemlem. Veronica Leoni and Sergio Zambon split the design duties of 2 Moncler 1952 for women and men, respectively, for the Fall/Winter 2019 season. 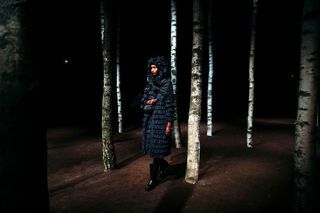 Leoni reinterpreted the Moncler code by taking a wide range of materials, like bouclé wools, fishnets, bleached tartans, padded tailoring, fur and knit mixed with nylon, and combining them surprising yet pragmatic shapes. With the men’s offerings, Zambon reworks the heritage of Moncler as something rooted in youth culture. 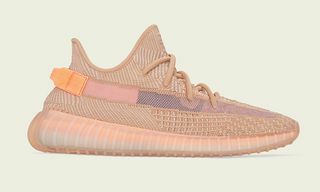 Through the use of muted colors and laminated touches, a pop spirit with a relaxed attitude is felt in his work, all while maintaining a focus on strong technical features. 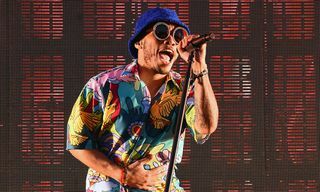 Sandro Mandrino found a way to connect seemingly disparate worlds, creating mountain gear equally suited for rave culture. 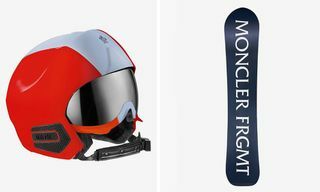 “The mountain is where Moncler Grenoble belongs, which means that performance is focal. I stuck to the brief in terms of fabrics and shapes, but went the opposite way in terms of treatments, opting for tie-dye, fringes and patchworks that have a crafty feel. Still, you can ski in these”, says Mandrino. The lively presentation was done with Icelandic artist Hrafnhildur Arnardóttir, also known as Shoplifter. 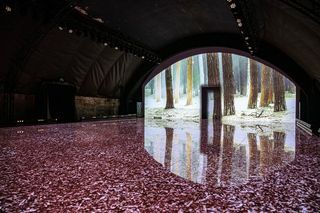 In addition to its premiere at Moncler Genius FW19, the installation will be presented from May onwards during the Venice Biennale at the Icelandic pavilion. Irish fashion designer Simone Rocha took her trademark romantic shapes and created a unique silhouette that adheres to her design principles while protecting against the elements. 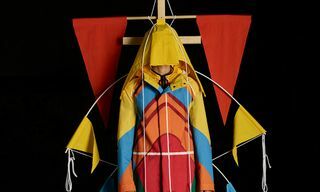 Voluminous silhouettes inspired by tenting, blankets that turn into capes and a signature Broderie Anglaise meet the great outdoors, creating a new uniform for nature. 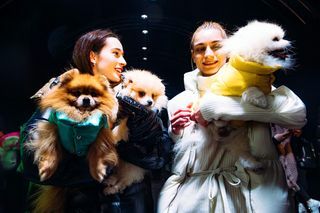 A welcome contrast to the beauty and seriousness of the other collections, Poldo Dog Couture, which launched in Milan in 2016, continued its series of puffer jackets for dogs in a faux supermarket/holiday-themed mall. The collection features the classic duvet dog vest in two sizes and many different colors in nylon laqué, alongside a knit-effect print. 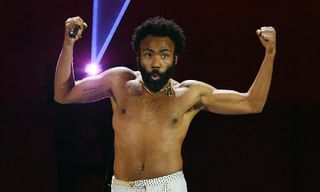 Kicking things off ahead of the opening, all of the Moncler Genius designers gathered on the red carpet to essentially recreate the campaign imagery spotted all over the city. 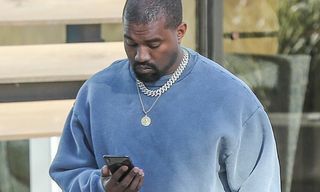 Taking in the incredible collections for the first time alongside industry insiders were influential figures such as Millie Bobby Brown, Kerwin Frost, Alessandra Ambrosio, and Luka Sabbat. #MONCLERGENIUS unleashed on a gathering of creative minds. 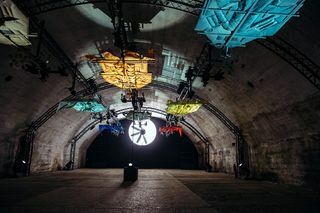 _ #MonclerFriends discover the tunnels that house visions of the future. A labyrinth of tunnels filled with raw creative power. 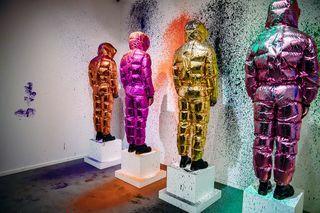 _ #MONCLERGENIUS unveils its new creations. 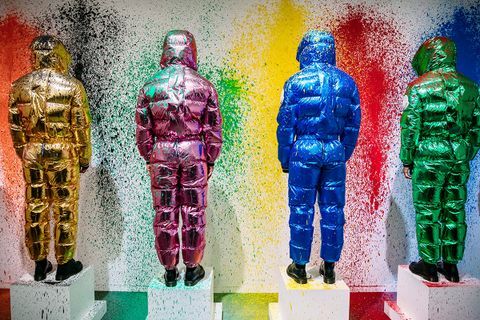 Three seasons in and it looks like Moncler Genius is only just getting started. 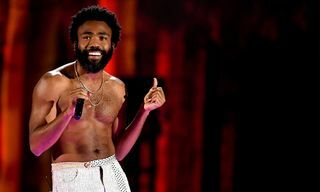 If the iconic brand keeps outdoing itself, next season will be even bigger and better. Look for the Fall/Winter 2019 Moncler Genius collection to hit select retailers and Moncler.com later this year.